The all-new Mercedes-Benz S-class coupé has been unveiled, and will become the first series-production road car to feature an advanced tilt function capable of leaning the car into corners when it goes on sale towards the end of this year. The new feature is integrated into the so-called Magic Body Control system first seen on the latest S-class saloon. It forms part of a series of new comfort-enhancing technologies brought to the two-door rival to the Bentley Continental GT. The S-class coupé is scheduled to made its public debut at the Geneva motor show early next month. It will replace the CL at the top of Mercedes’ regular line-up. The new model, which goes under the internal codename C117, has been given a significantly more muscular appearance. The styling flourishes are aimed at visually separating the S-class coupé from the saloon more than previous versions of the big two-door have done. Mercedes has confirmed one initial engine for the new S-class coupé. The twin-turbo 4.6-litre V8 petrol unit is carried over from the CL, but with a series of detailed changes that boost its power output by 20bhp to 448bhp while retaining the same 516lb ft maximum torque rating. That engine will appear in the S500 coupé. Alongside standard rear-wheel drive, buyers will also get the option of 4Matic four-wheel drive for the first time. Performance figures have not been revealed yet. 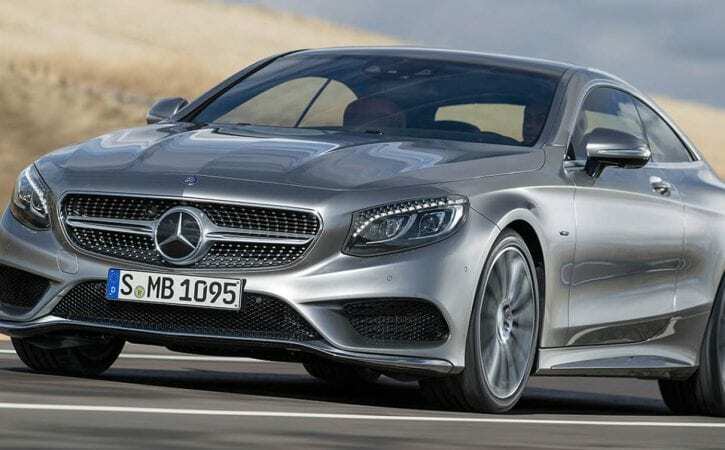 However, Mercedes sources suggest that the S500 coupé will closely match the standing-start acceleration and top speed of its CL predecessor, which had an official 0-62mph time of 4.9sec and a top speed limited to 155mph. The S500 will not be the first S-class coupe model to be sold in the UK, however. The launch model here will be a S63 AMG variant, which will be revealed at the New York motor show in March. This model will use the same 577bhp twin-turbocharged 5.5-litre V8 engine as the S63 AMG saloon. A V12-powered S65 AMG variant is also planned. Although it has not yet been officially confirmed, a further two petrol engines will be added to the line-up after the S500 and S63 AMG versions. One will be the updated twin-turbocharged 6.0-litre V12 recently unveiled in the S600 saloon. With an added 500cc of capacity over the unit that it replaces, it is expected to provide the upcoming S600 coupé with 516bhp and 612lb ft of torque. On top of the optional tilt function, the new car’s Magic Ride Control system also boasts a road scanner function. This uses the stereo camera mounted within the windscreen to digitally scan the road surface and automatically alter the stiffness of the hydraulic dampers in order to improve the ride comfort. Among the standard spec offered in the UK will be a panoramic roof. The S63 AMG coupe is set to go on sale in the UK from November. Prices for this model have yet to be revealed, but the S500 which will closely follow it is expected to be offered at a price close to £100,000. Mercedes’ first experiment with tilting wheels came way back in 2001 with the F400 Carving concept. When cornering, the wheels on the outside of the bend tilted by a much as 20deg, which, engineers said, improved directional stability and roadholding and reduced the chances of skidding. In the new S-class coupé, corners are detected by a stereo camera mounted within the windscreen and a transverse acceleration sensor. The hydraulic damper units of the air suspension alter the rate of firmness and crucial base point for each individual damper, automatically inclining the body up to 2.5deg between 19mph and 112mph to reduce lateral acceleration acting upon occupants.